This is the most exciting physics-based puzzle game you have ever seen. 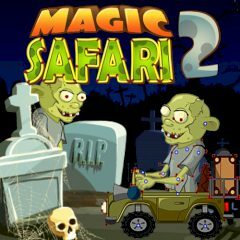 Try to destroy and alter shape of objects, reverse gravity and use magic to guide the bear through a hazardous safari! Do you think that it is so easy? Well, then just try it and be sure that you will cope with such a difficult task. Use all the tips and try to do everything perfect, so be sure that you will love this cool puzzle game. Enjoy it right now and you will have so much fun. Be the real king of the puzzle world. Enjoy it.